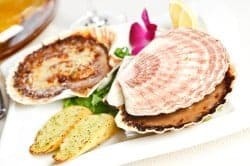 Macaroni Grill Baked Creamy Seafood is a delicious dish that incorporates a variety of seafood such as baby scallops, shrimp, clams and so much more. All in a creamy seafood sauce this goes so well with pasta. You are going to love Macaroni Grill Baked Creamy Seafood when you make it at home. In a large skillet, melt 1 tablespoon butter. Add scallops and stir-fry over high heat until just cooked through; set aside in a bowl. In the same skillet, melt remaining 3 tablespoons butter over medium heat. Whisk in flour until smooth and bubbly. Cook and stir 1 minute. Whisk in half-ana d-half and continue whisking until mixture comes to a boil. Boil 1 minute, whisking, until bubbly. Turn off the heat. Add Asiago cheese, stirring until melted. Stir in the scallops, shrimp, and clams. Spoon into a 9-inch glass pie plate. Sprinkle with the Parmesan cheese. Bake in a preheated 350-degree oven for about 15 minutes, until the top is golden brown. Meanwhile, heat plenty of oil in a wok or deep fryer to 375 degrees. Fry 3 or 4 wonton skins at a time, a few seconds on each side, until just golden. Drain on paper towels. Use wantons as chips for dipping into a baked sea-food appetizer. NOTE: If you don't feel inclined to fry the wonton skins to make chips, the seafood appetizer is also delicious served with tortilla or pita chips or crackers of your choice. Do you have recipe for Speidino del Mar from Carrabas? Or a really good Mexican chicken tortilla soup copycat? This was great! My company really enjoyed it! They all requested the recipe!